China (mainland) Guangdong Dongguan,Junli Industrial Park, Wanjiang XiCheng Business Center, Dongguan City, Guangdong Province, China. 1. Imported TPU raw material, eco-friendly., anti-aging. 2. Excellent resistance to low temperature performance. 3. 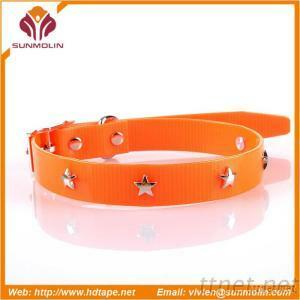 TPU coated finish treatment makes pets collar soft, protect your pets from harm. 4. Durable, more than 5years service life. 5. Dirt proof, TPU coated finished makes webbing easy to clean. 7. Abrasion resistance, high tension. Material: Webbing and outer rubber need to match. Webbing: nylon, tetoron, kraft, polypropylene. Color: Be customized in accordance with international color card, Logo printed is available.